Heat oven to 450°F. Line cookie sheet with foil; spray foil with cooking spray. In medium bowl, stir together Bisquick mix, very warm water and olive oil until Bisquick mix is moistened. Let stand 15 minutes. Knead dough slightly to form ball. Divide dough into 8 parts. Flatten and use rolling pin to roll each into circle about 1/8-inch thick. Place circles on cookie sheet. Top each with 1 tablespoon marinara sauce, 1 pepperoni slice and 1 tablespoon cheese. Fold over, and pinch edges to seal. Enjoy hot, or cool completely, wrap in plastic wrap and freeze until ready to use. 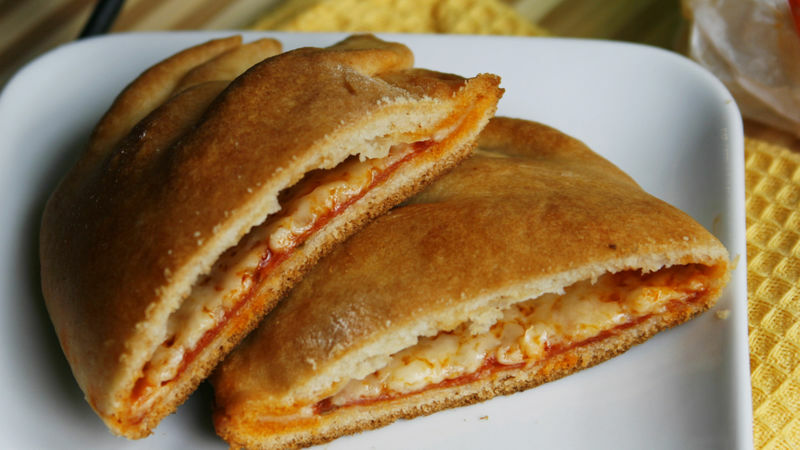 These pizza pockets are particularly good for kids who have access to microwave ovens at school (like many high schoolers do). In order to keep the sandwiches safe until lunchtime, place frozen sandwiches in an insulated lunch bag with frozen ice packs. To reheat, remove sandwich from plastic wrap, and wrap in paper towel. Microwave 30 to 45 seconds or until hot in center (filling will be hot). Microwaves vary; sandwiches may take more or less time than indicated to become hot in center. It’s essential that the dough is rolled thin before using; that way, the pocket isn’t overwhelmed by a thick exterior.